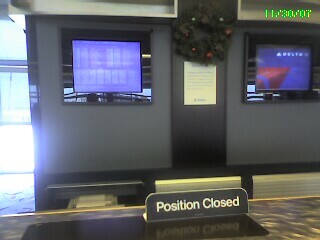 In case you can't make out this picture, it is a Delta service counter with the infamous "blue screen of death". How many times have you seen a display monitor with the "blue screen". The sad thing is most people are too familiar with that display. In a discussion about workflow and why employees perform certain tasks David Parkes, Director of Information Technology at Cushing, described certain processes as "scar tissue". When you ask why somebody is performing a certain task or series of tasks the employee will often describe a problem they had in the past and how these tasks will avoid that problem in the future. I have seen this first hand. When talking with an employee who was preparing files to be imported into a plan room the employee described about 12 separate tasks that included renaming files, running files through different programs, and copying the files into multiple directories. Many of these processes were put in place to allow an employee to "go back" to a previous "state". If a customer complained about the quality of a file they could go back and find where in the process the problem occurred. Although in isolation all of these processes made sense they were "scar tissue". By mapping out the larger process flow and the problems that birthed these tasks a more streamlined workflow could be engineered with less steps and often a higher degree of accuracy. This is often without implementing any new technology. The key is digging into the root cause of why tasks are performed and then determining (1) if they need to be performed at all, or (2) if they should happen somewhere else in the workflow. We all talk of having strategic relationships with our customers, but Seth Godin in his book "Permission Marketing" categorizes stages of loyalty or trust in a commercial relationship. The highest level is what he calls "Intravenous". This is the relationship you have with your doctor when you are in a life threatening situation. You put your trust into the doctors hands to save your life and you trust that he will charge you a fair price for his services. You trust that the doctor will do the absolute right thing. Many companies have intravenous relationships with a law firm or an accounting firm. They trust that the law firm or the accountants are working in their best interest and rarely question fees. This is the ultimate type of business relationship to have, but must be treated with the utmost respect. All profits derived from this relationship must be without any doubt "good profits". As soon as the customer believes that you are abusing the intravenous relationship and extracting value instead of adding value the relationship will end abruptly and the chance of resurrecting the relationship is slim. Reprographers around the world are coming the conclusion that by turning their satellite locations into a "destination" they can better serve their customers and grow their businesses. Starbucks has mastered this. Their marketing strategy is to create a third place. It's not your home, it's not your office, it's the other place you go to relax or meet friends. Apple has recently embraced that strategy. They opened Apple stores around the country. These stores are impressive looking and staffed with very pleasant helpful and competent people. They create reasons for people to come into their stores. I was driving by and stopped in to see what was so special about the iPone. They are offering free training, consulting and technical support in the store. Recently Apple has seen a growth in their Mac sales and they attribute it to people coming into the stores to buy iPhones and iPods.